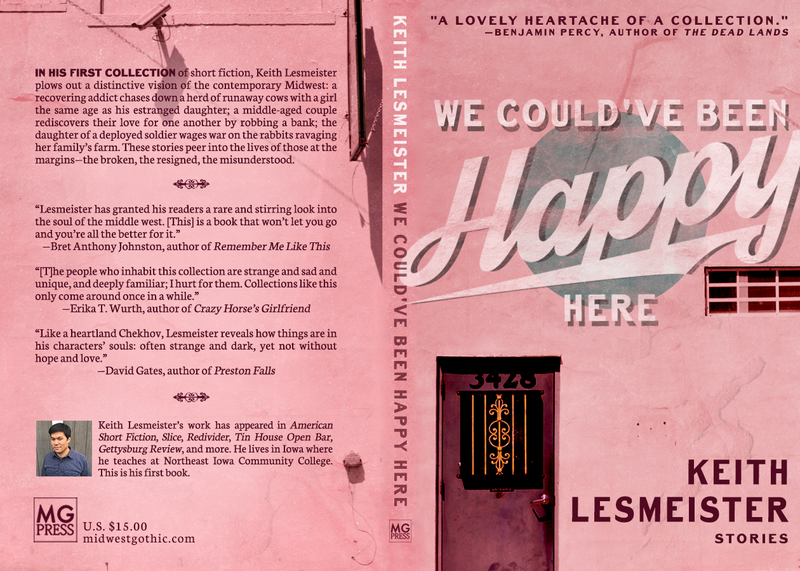 We are so excited to share more details of our upcoming MG Press title to be published Spring of 2017, the short fiction collection We Could’ve Been Happy Here by Keith Lesmeister! From the back cover: In his first collection of short fiction, Keith Lesmeister plows out a distinctive vision of the contemporary Midwest: a recovering addict chases down a herd of runaway cows with a girl the same age as his estranged daughter; a middle-aged couple rediscovers their love for one another by robbing a bank; the daughter of a deployed soldier wages war on the rabbits ravaging her family’s farm. These stories peer into the lives of those at the margins–the broken, the resigned, the misunderstood. In addition, you can pre-order a copy of the book for only $1, and save 20% off the cover price when it launches in 2017.